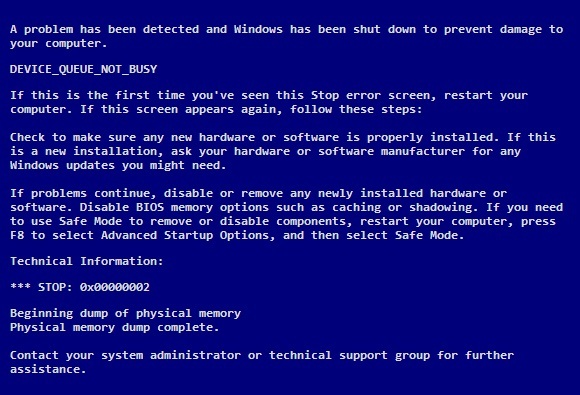 Also known as a STOP message, the DEVICE_QUEUE_NOT_BUSY Blue Screen of Death Error is a rare Windows error that usually happens when a program that is incompatible with the system is used. Automatically, the computer will shut down to prevent more fatal data loss. Usual causes are as follows: 1) a .dll file is either missing or recently corrupted, 2) the memory allocation of the computer is incorrect, and 3) the computer is processing wrong data. Any previously unsaved work or data will be immediately lost after the error has occurred. There are many ways of fixing the DEVICE_QUEUE_NOT_BUSY error. For those who are not computer savvy, the simplest way of fixing this error is to do the manual update way which is to revert to the last successful boot. In order to do this, one must restart the computer and wait for it to reach the BIOS messages. Immediately press the F8 key after seeing the BIOS message. Take note that if the software is asking you to go to the BIOS setup, then you have pressed the F8 key sooner. After successfully pressing the F8 key, a black screen will appear and you can now choose “Windows Advanced Options”. Afterwards, highlight the “Last Known Good Configuration” and press Enter. Another manual way of fixing this particular error is to add more memory in the operating system. Try uninstalling the most recent program installed. This must be the main cause of the problem. To delete a program, click the Start button and go to the Control Panel. Click Programs and Features and then uninstall the most recent, if not the least priority, program. When the first two processes did not acquire the desired results, do the more complex manual update way by opening the computer and log on as the computer administrator. Click the Start button, then All Programs, and go to System Tools and choose System Restore. Afterwards, click the Restore My Computer to an Earlier Time button and you can now choose the new main system repair. Restart the computer after the process. People with more advanced computer knowledge, on the other hand, have another option in fixing the DEVICE_QUEUE_NOT_BUSY problem. The automated way should only be performed when the manual way failed. Start the process of downloading driver repair software from the manufacturer. Scan for viruses and install it. Follow the instructions given by the software. Restart the computer after finishing the process.